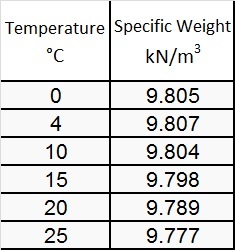 Specific weight of water. One of water’s unique properties is that it is heaviest at 4° C (39.2° F) and becomes lighter as it warms. It is also lighter as it cools further from 4 to 0° C.
One of water’s unique properties is that it is most dense or heaviest at 4° C (39° F) (Figure 1). This fact means that as the surface temperature of a lake approaches 4° C, either by warming from colder temperatures (spring) or cooling from warmer temperatures (fall), the surface water will sink to the bottom and in doing so it will mix the waters of the lake. The type and amount of mixing allows for an unique classification system(1) for lakes. In general, holomictic lakes are all lake types that mix. Meromictic lakes have stable layering at depths and can contain stagnant or dead zones or high saline or dissolved mineral zones. Mixing occurs at the surface and upper layers only in a variety of class types. For example, a meromictic lake having a stable deep region can be classed as warm monomictic for its surface and upper layers. Fetch size (longest length of the waterbody surface) will also play a role in mixing rates (see Figure 2) with longer fetches allowing for larger waves and more mixing. As the surface temperature of a lake approaches 4° C (39.2° F), either by warming from colder temperatures (spring) or cooling from warmer temperatures (fall), the surface water will sink to the bottom and in doing so it will mix the waters of the lake. Figure 2. Estimated distribution of the eight lake mixing classification types in relation to latitude (adjusted for elevation) and water depth. From W.L. Lewis, Jr. Can. J. Fish. Aquat. Sci. 40 (1993) 1779-1787. © Canadian Science Publishing. 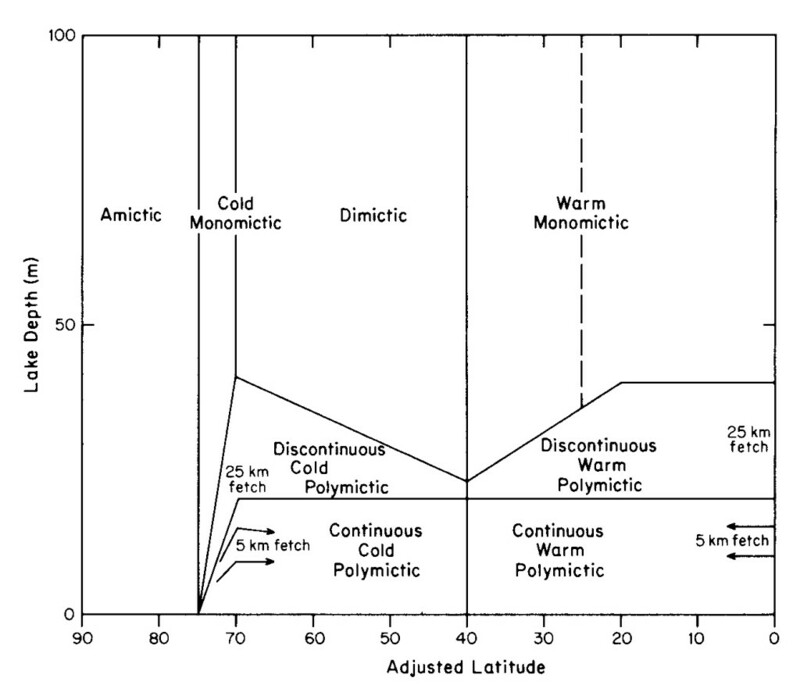 From Figure 2 we can ascertain the type of lakes in a particular region. For southern Ontario (~43°N) most lakes will be dimictic, with shallower lakes and ponds being mostly discontinuous and continuous cold polymictic in nature. 1) W.M. Lewis, Jr. Can. J. Fish. Aquat. Sci. 40 (1983) 1779-1787.